The ongoing conflict in Ukraine is having a significant impact on the rights to freedom of expression, association and peaceful assembly, particularly for those people in the conflict zone. In November 2018, a new crisis between Russia and Ukraine erupted. According to reports, Russia seized three navy vessels and detained several Ukrainian crew members. In November 2018, a new crisis between Russia and Ukraine erupted. According to reports, Russia seized three navy vessels and detained several Ukrainian crew members. Russia alleged that vessels were "illegally entering Russian waters". 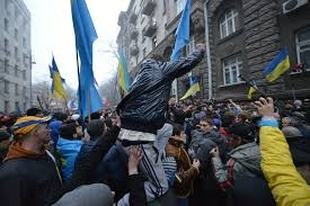 As a result of this incident, on 26th November 2018, citizens held a protest outside the Russian embassy in Kyiv. Reports indicate that demonstrators "fired flares and lit a car on fire". The Ukrainian diaspora also protested outside the Russian embassy in Washington D.C.
"While the Ukrainian government has duties to ensure national security, authorities do not have a carte blanche to restrict rights. Any such restrictions have to be justified as proportionate and necessary to respond to the specific threat and by specific circumstances. The government should not restrict rights simply as a pretext to clamp down on discontent or chill critical voices." In October 2018, Carnegie Europe published the report The Mobilization of Conservative Civil Society that analyses "what conservative civic activism portends for global civil society". The case studies include countries where the role of conservative CSOs "has become widely debate". In Ukraine, the report stated that two different types of conservative civil society are on the rise in the country: those that focus on "conservative social and religious values" and the radical far-right groups. One of the conclusions of the report was that radical right-wing groups "propagate and justify political violence against “others” who are seen to endanger the nation." This tactic seems to "attract supporters who are frustrated that peaceful civic activism is not bringing quick political change." These actions, according to the report are conducted while "state authorities seem to tolerate [...] and offer them a protective cloak of impunity." The process to register and form an organisation is easy, and the legal framework for civil society is mostly open and supportive. The process to register and form an organisation is easy, and the legal framework for civil society is mostly open and supportive. The government does not have wide power to deregister an organisation and there are no documented cases of illegal or arbitrary dissolutions of organisations. However, since 2015, CSOs are required to open bank accounts only in state banks, which could open the door to state interference. In the areas controlled by armed groups, human rights organisations have been targeted and forced to leave, while the remaining CSOs carry out primarily humanitarian work. The constitution guarantees the right to peaceful assembly and requires organisers to give the authorities advance notice of any demonstrations. The constitution guarantees the right to peaceful assembly and requires organisers to give the authorities advance notice of any demonstrations. During the 2014 ‘Euromaidan’ protests, many protestors were arbitrarily arrested and the police used deadly force to disperse protestors, resulting in hundreds killed. As a consequence the government also passed legislation to criminalise the demonstrations. No one has been held to accountfor the killing of protestors and other human rights violations during this period.Recently, the government has been more tolerant of demonstrations, but the police have still failed to protect protestors from clashes. Despite police protection during a recent Pride march, right-wing activists attacked the march resulting in 10 injured participants. Freedom of peaceful assembly continues to be significantly violated in the territories controlled by armed groups. The media landscape has improved since the end of the Yanukovych administration in 2014. Journalists face violence and intimidation, and the government’s intolerance of pro-Russian or pro-separatist views has increased. The media landscape has improved since the end of the Yanukovych administration in 2014. Journalists face violence and intimidation, and the government’s intolerance of pro-Russian or pro-separatist views has increased. Journalist Oles Buzina, well known for his pro-Russian views, was shot dead by two masked gunmen in front of his house on 16 April. The Interior Ministry banned the broadcast of 14 Russian channels, and the authorities have also detained pro-Russian journalists and barred many others from entering the country. The new law on public broadcasting aims to address the concentration of ownership of private outlets in a small group of businesspeople, as a way of increasing media plurality. Libel was decriminalised in 2001, although civil suits are still used against journalists. No websites are permanently blocked in Ukraine, but some Ukrainian news websites in non-government controlled areas have been blocked. Social media users tagged as ‘separatists’ or ‘extremists’ have been targeted with harassment and intimidation. Journalist Ruslan Kotsaba was arrested on charges of treason after he posted a YouTube video calling on viewers to boycott military mobilisation in Ukraine. Media workers operating in the territories controlled by the armed groups face hostility, extreme intimidation and physical violence, as well as widespread self-censorship.